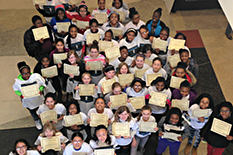 The Maryland Cybersecurity Center (MC2) hosted the fifth Cybersecurity and Cybersafety Workshop for Girls at the University of Maryland Feb. 28. More than 60 middle school girls from Maryland, Virginia, and Washington, D.C., gathered on campus to participate in the workshop, excited to learn about how to use safe online practices and how technology affects their daily lives. In the morning, Anna Mallepalle, a UMD alumna and systems engineer at Cisco, spoke to the students about careers in science, technology, engineering, and math (STEM) fields. Students were excited to hear about how technology can make a difference in people’s lives, and they enjoyed hearing Mallepalle discuss some technological innovations they may see developed in the near future. After the morning session, students were separated into smaller groups that rotated through four stations throughout the day. Students used creative problem-solving skills and team work to complete hands-on, interactive activities about internet safety. UMD undergraduate students majoring in computer science and engineering led each activity, engaging students in a variety of topics including social media safety and cryptography. At the end of the day, participants shared what they had learned with their parents during the closing ceremony. Each group presented a poster about one of the activities they participated in, and each student received a certificate and T-shirt to acknowledge their participation in the workshop. Many volunteers came from the Advanced Cybersecurity Experience for Students (ACES), a unique cybersecurity honors program at UMD, and from Virtus and Flexus, two engineering focused Living and Learning Programs. Participants enjoyed getting to know their UMD mentors through a “speed meeting” activity where they learned about their group leaders’ interests in cybersecurity, majors and future career plans. This program is one of the many educational outreach programs offered by MC2, which are designed to encourage young people to pursue careers in cybersecurity and other related fields. Future events for middle school and high school students can be found www.cyber.umd.edu/education here.